In most of the world, the asymmetric nature of your average Internet connection means that, unless you are lucky enough to be on a corporate network or fiber reaches your house, sending large files to your friends and colleagues is often an exercise that requires a lot of patience. Most of it is spent waiting for files to upload and dealing with complex workflows that tend to take up more time than they're worth. This is where the recently-launched Minbox comes into play. Its developers have set their sights on turning file sharing into as frictionless a workflow as possible, while keeping costs down to a rather cool zero dollars. There is, of course, no shortage of competing products that attempt to reduce the stress of sharing data—Dropbox and Droplr come to mind—but their focus is primarily on providing you with storage in the cloud, rather than on simplifying the process of sharing one or more files with a specific group of people. It’s this latter case that Minbox hopes to streamline. Minbox is made up of two components: a cloud-based backend and a small OS X app that is free, weighs in at a little more than 1MB, and works with Snow Leopard or later. Once installed, and after going through a few set-up steps, the app sits quietly in OS X’s menu bar, awaiting your orders. The company has adopted a queuing system that requires users to sign up for the service and then wait while more and more slots are opened on its backend—a mechanism more recently used by the developers of the Mailbox app, which, coincidentally, was later acquired by Minbox rival Dropbox. Luckily, at least when I tried it, the queue was only about three or four days long. 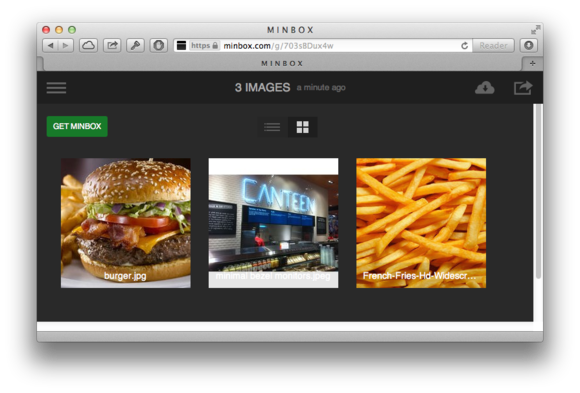 Using Minbox feels very much like using email, but with less heartburn. Minbox is exceedingly easy to use: You simply drag one or more files over to it, type in a your recipients and an optional message, and hit Send. In the background, the app proceeds to upload your files to a cloud-based location, and then notifies the recipients that the data is ready for download. In a way, this is similar to sending an email, but, in reality, it is much cleverer. For one thing, email can only transfer data in textual form; binary files have to first be converted to a format known as base64, which adds considerable overhead, slowing down your transfer even further and consuming more bandwidth. If that weren’t bad enough, your email message must then be sent to every recipient individually, creating multiple copies, and, potentially, a considerable amount of animosity from your friends and colleagues—something that anyone who has ever had to deal with receiving gigabyte attachments in their inbox can relate to. With Minbox, files are automatically compressed (the app even supports lossy compression options for things like images, sound files, and videos), and then transferred securely to a central location. The recipients only receive a simple email that directs them to a Web URL, where the data can be downloaded or viewed directly online in the form of slick HTML5-powered galleries—which, incidentally, can even handle images in RAW format. Uploaded files can be downloaded, or, where it makes sense, viewed using a slick HTML5 gallery. Compared to its competitors, Minbox’s genius is that it turns the sharing process upside down by allowing you to complete your entire sharing transaction in one go, and then taking care of the data transfer process in background while you’re safely off doing something else. While this doesn’t speed up your Internet connection, it does help reduce the likelihood that you’ll forget that you were waiting for the files to upload only to later find out that your intended recipients are still waiting for the data you promised them. Minbox also has the added advantage of being totally free—in fact, you don’t even need to use its emailing mechanism, and can instead opt to upload files directly and get a link to their cloud copies that you can share however you like. The only limitation that Minbox imposes on its users is that the uploaded files expire after thirty days, at which point they’re purged from storage and become unavailable. Otherwise, there are no restrictions either in the size of the files, or in the frequency of the sharing. The company plans to incorporate longer data retention periods, in addition to enhanced security features, in an upcoming “Pro” edition, although no pricing or availability have been announced. In my tests, the app performed well, and its workflow definitely feels like an improvement over most other sharing mechanism. The makers of Minbox have focused on an interesting gap in the way today’s sharing services work. By bridging the power of Dropbox with the convenience of email, and throwing in an irresistible price point, they have created a product that definitely deserves a spot in your menu bar.